Pancakes! Did someone say pancakes? 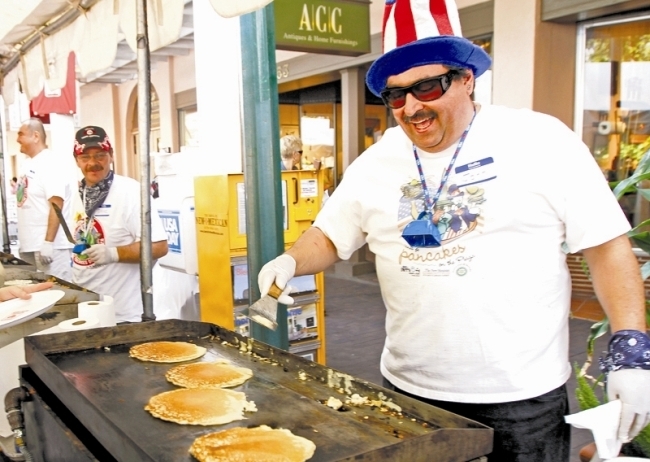 This is the 37th Annual Pancake Breakfast here in Santa Fe! Santa Fe kicks off America’s birthday with a big feast on the plaza! Every year on July 4th the Rotary Club of Santa Fe and The New Mexican put on this great family event! It is open to all who would like to attend! They make loads and loads of pancakes with your choice of bacon or ham! Proceeds from the event are split between Rotary Club of Santa Fe and The Santa Fe New Mexican, and given to not-for-profit organizations that meet the grant criteria of each organization. Air National Guard Band of the Gulf Coast will help provided musical entertainment at the annual Pancake breakfast and people were singing and dancing everywhere! This event occurs every July 4th. Mark your calendars for next year and come visit us in the beautiful 505! Keep a look out on Santafe.com for next year’s event! They list all the fun filled activities that go on throughout the day! Be safe out there and have a great holiday! This entry was posted in Uncategorized and tagged air national guard, breakfast, downtown santa fe, Eating, fourth of july, newspaper, pancakes, rotary club, santa fe day, santa fe new mexican, travel, vacation, Vacation Rental. Bookmark the permalink.